Joseph Paulsen, assistant professor of physics in the College of Arts and Sciences (A&S), has been awarded a five-year Faculty Early Career Development Program (CAREER) grant from the National Science Foundation. The project, titled “Ultrathin sheets on curved liquid surfaces: Stress focusing and interfacial assembly,” looks to investigate so-called “geometric frustration” in a class of extremely bendable materials. The effects of mismatched geometries are familiar: flat bandages don’t stick so well to curved knuckles or elbows, and automotive metal must be laboriously stamped or forged to make a fender. Paulsen’s team aims to get something useful out of all this frustration. They will study how ultrathin polymer films (a thousand times thinner than a human hair) can be guided along curved liquid surfaces in predictable ways. The hope is that these studies will uncover new ways for controlling liquids, whether it is containing toxic or corrosive substances or a new way of delivering medicine to where it is most needed in the body. In addition to funding the research, the grant allows for several outreach components beyond the Syracuse University campus. The grant will support two Ph.D. students and one undergraduate researcher. Lab members will be trained to work with local high school students interested in learning more about soft matter research. High school teachers will also be invited to conduct research internships, and a laboratory YouTube channel will be created with the potential of reaching a worldwide audience. Young scientists from all over Upstate New York will also be able to get hands-on experience with the physical science with an installation on wrinkling currently being developed for the Museum of Science and Technology (The MOST) in downtown Syracuse. 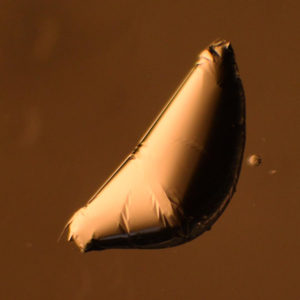 A circular polystyrene sheet wrapping a water drop immersed in silicone oil. The sheet is 39 nm thick and 3.0 mm in diameter. 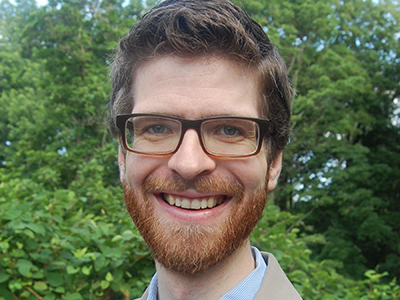 Paulsen joined the Syracuse physics department in 2015 after spending two years at the University of Massachusetts Amherst as a postdoctoral research associate. He received his Ph.D. in physics from the University of Chicago, and is a member of the American Association of Physics Teachers and the American Physical Society. The Faculty Early Career Development Program is one of the National Science Foundation’s most prestigious awards in support of the early career-development activities of teacher-scholars who most effectively integrate research and education within the context of the mission of their organization.